The story of Medusa has always infuriated me. 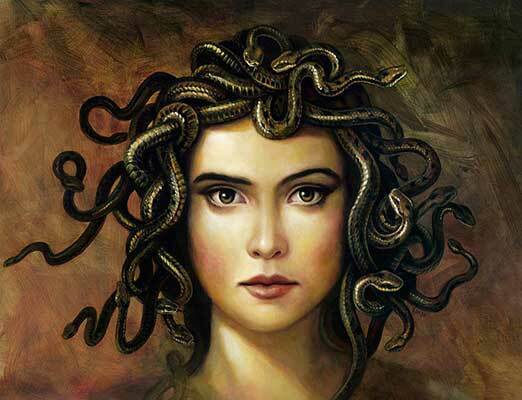 According to some, Medusa was fleeing the god Poseidon and took refuge in Athena’s temple. Being Greek god however, this didn’t stop him and he raped her. 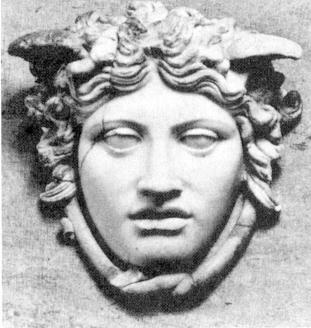 Athena was so outraged by the desecration of her temple that the turned the once beautiful Medusa into a hideous gorgon with the power to turn people (men in particular) to stone with a look. 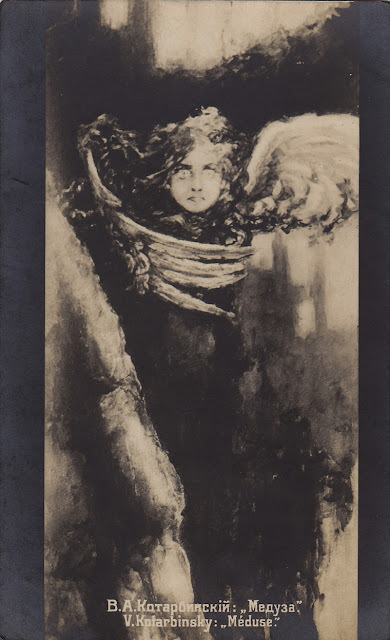 And to make the whole matter worse “while Medusa as well as her adders lay buried in sleep, he [Perseus] had lopped her head from its neck.” (Ovid’s Metamorphoses, 4.784-5). The jerk kills her while she’s sleeping and gets worshipped as a hero. Ridiculous. But if they got it on all nice in a meadow somewhere why was she punished? WHY? I’ve tried to place these in chronological order, but couldn’t find dates for all of them so have placed those based on the artist’s birth/death dates. The reason for this is because my two favourite things about Medusa images are the way they have change/remained the same over time and the expressions on their faces. So sit back and enjoy the ride. Depiction of a gorgon from 600BC. God they were hideous. 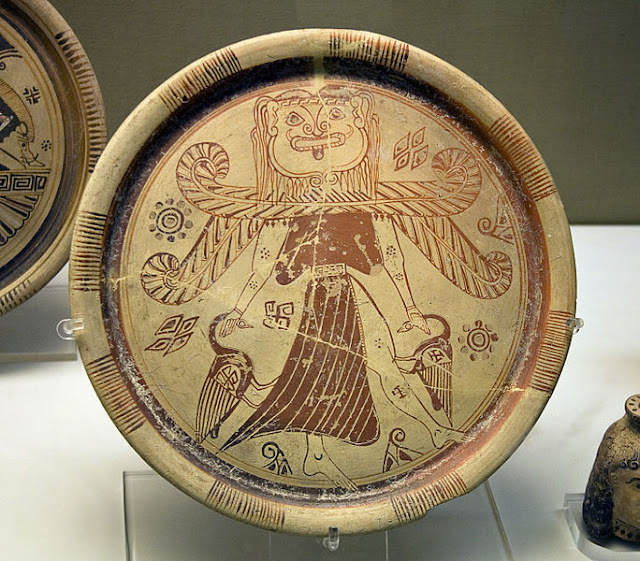 According to Homer, who wrote roughly around the 8th century BC, there was only one gorgon. If I remember what my lecturer said once upon a time, gorgons were often depicted with beards and tusks. I don't think they were specifically female to begin with either but gender neutral or with aspects of both sexes. Medusa Rondanini copy of original c.440BC. You may have noticed I don't usually include sculpture in this blog. I've included this one for the sake of a later painting which I believe picks up elements of this image. P.S. those are wings in the hair. Head of Medusa by Peter Paul Rubens, c.1617. It's interesting how the snakes to be coming free from her head, and there are also insects spiders and what I assume is a newt. 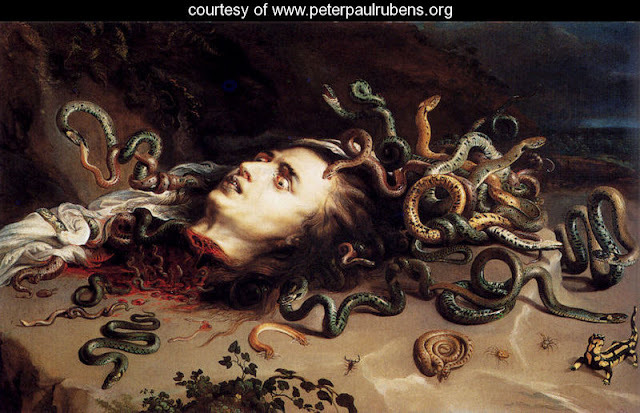 On the left two snakes seem to be fighting, with her death the ecosystem that is her head has been plunged into chaos. Perseus Cuts the Medusa’s Head off by Francesco Maffei, 1650. 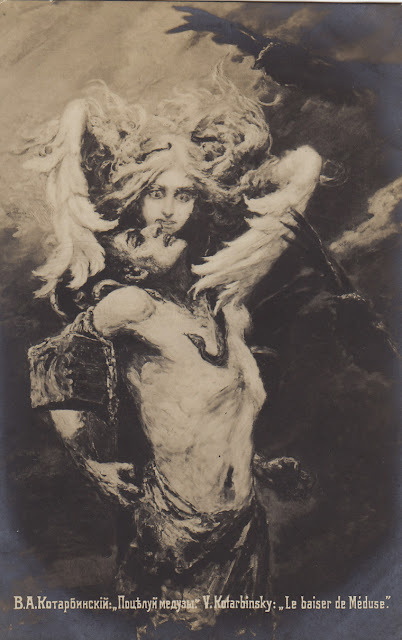 If the artist were alive today I'd ask him what made him decide to cover Medusa's face with her arm. So this is the painting that I think invokes elements of the Medusa Rondanini.Wings in the hair, straight on face. 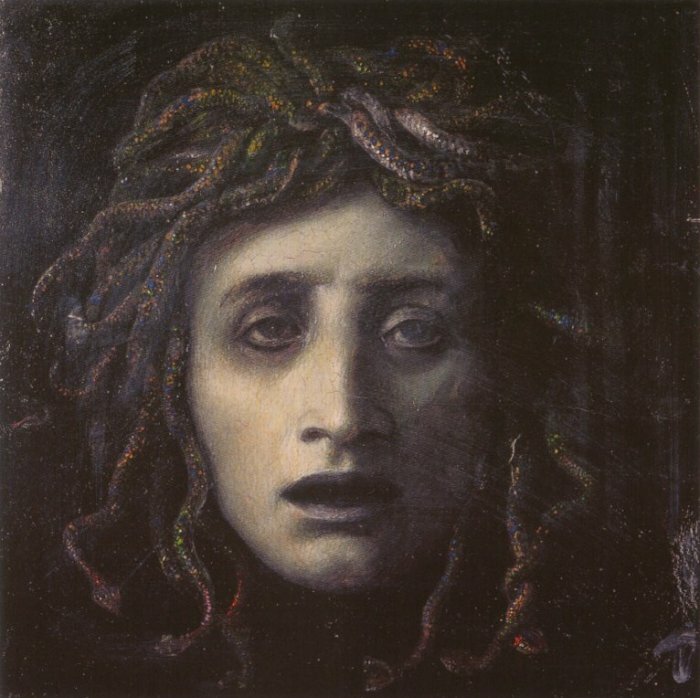 Aspecta Medusa by Dante Gabriel Rossetti, 1867. 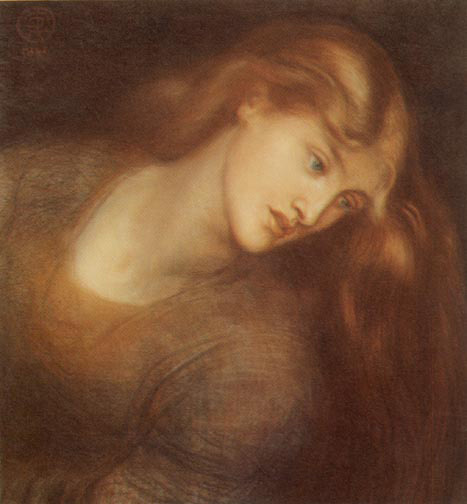 I like that Rossetti chose to depict Medusa's beautiful state, whether it's prior to the transformation or the beautiful side that still remains a part of her. 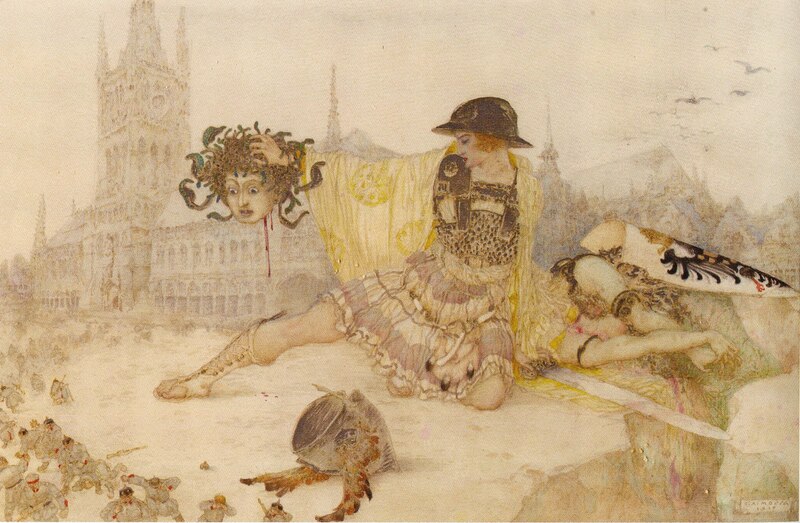 Perseus Slaying Medusa by Gustav-Adolf Mossa (1844-1926). The Kiss of Medusa by Vasily Alexandrovich Kotarbinsky (1849-1921). Focus on the wings (which she was often described as having) over the snakes makes it different, though I can't help but notice (and cringe at the thought of) that snake on his chest . 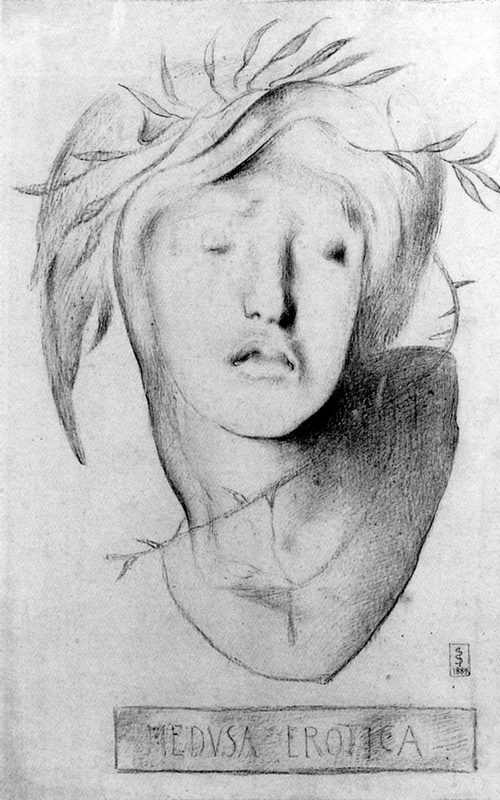 Medusa Erotica by Simeon Solomon, 1889. I tried finding information of this one and failed miserably. Oooh, moody. I love the hand and the expression on her face is breathtaking. 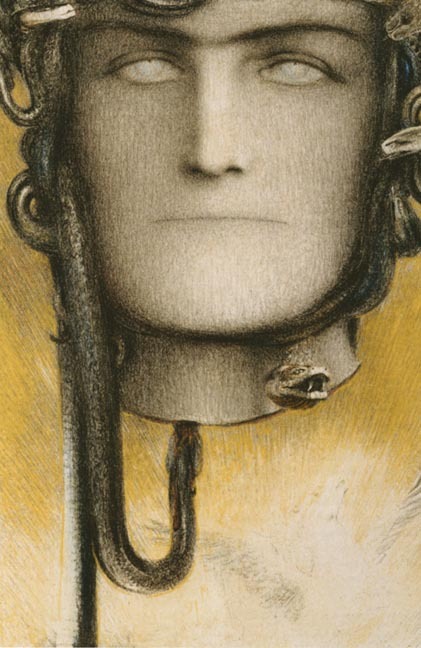 The Blood of the Medusa by Fernand Knopff, 1898. It was said the blood of the Gorgon had both the power to kill and to heal. Two drops of Gorgon’s blood. And these have some effect on men? One is poisonous, the other cures disease. The subtle rising of Pegasus (one of Medusa's children by Poseidon) in the bottom right corner sets it off nicely, and the snake just above is looking straight at me, I swear it's about to say something. 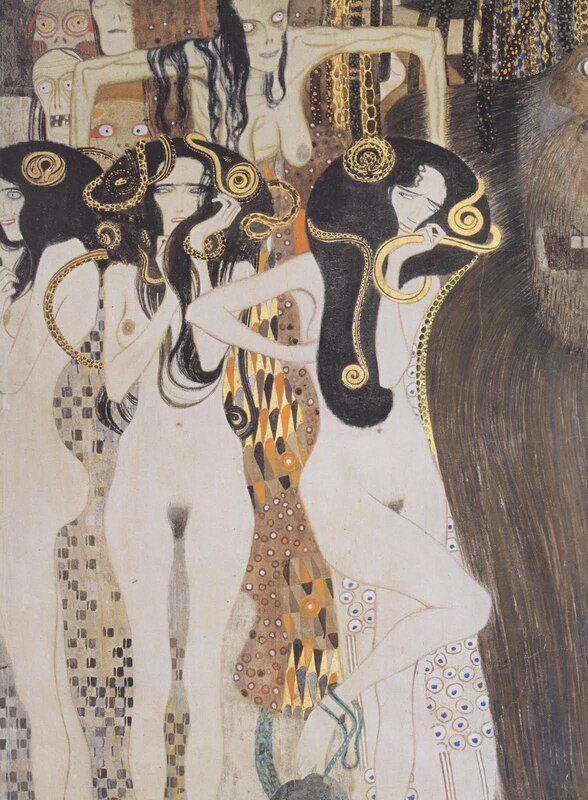 Die Gorgonen und Typhoeus (The Gorgons and Typhon) by Gustav Klimt, 1902. 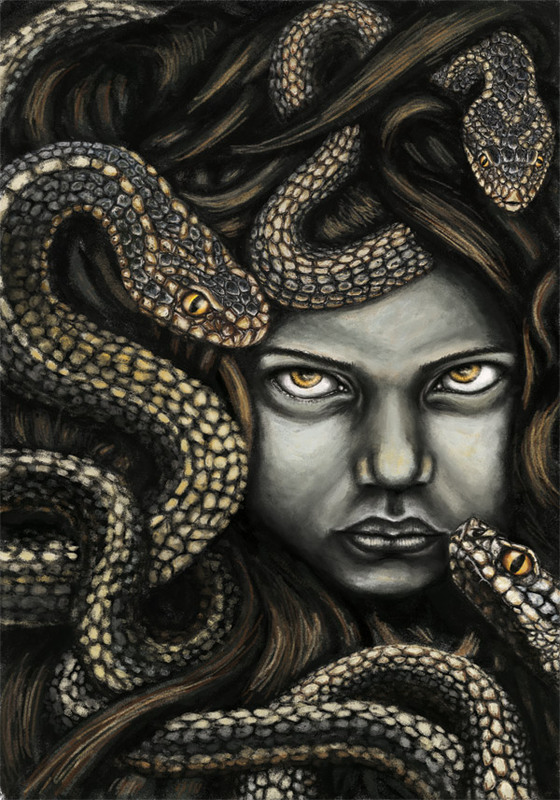 Medusa was believed to have two sisters named Stheno and Euryale. 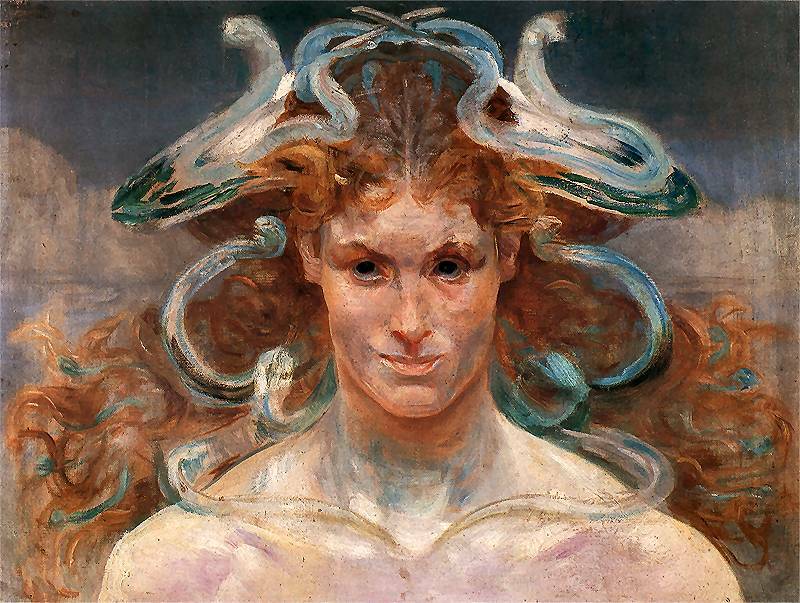 Like Medusa, both these sisters are gorgons, but unlike Medusa they are immortal. 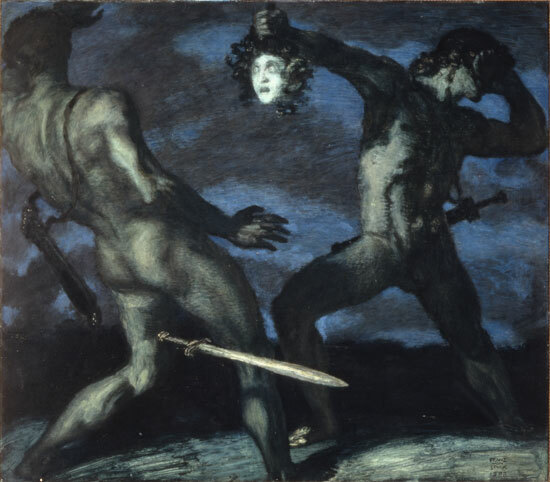 When Perseus kills their sister they mourn her and seek their revenge, unfortunately, they don’t get it. TTyphon is the father of all monsters, the woman (though hag might be more apt) could be Echidna, the mother of all monsters, or she, along with the other faces in the background, could be the Graeae, sisters to the gorgons and old women who shared a single eye and tooth between them. 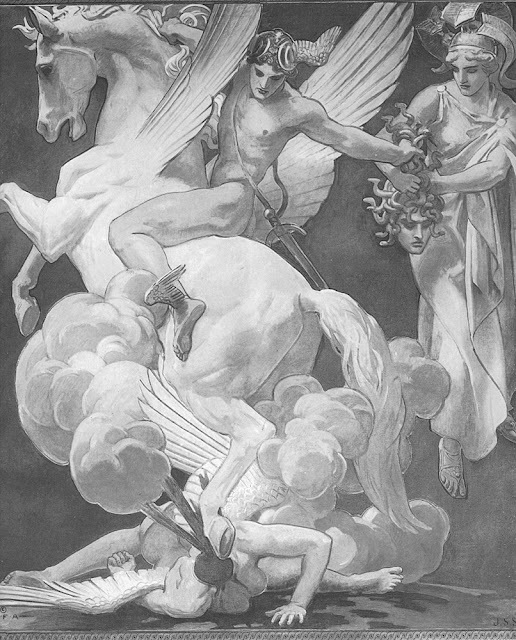 Perseus on Pegasus Slaying Medusa by John Singer Sargent, 1921-25. 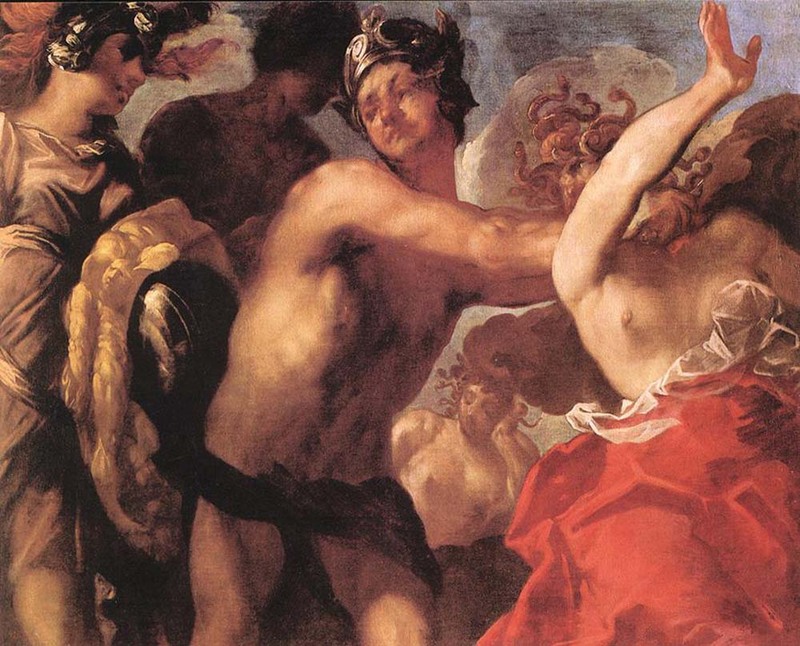 After using the gorgon head many a time (to get out of fights that aren't going so well) Perseus hands it over to Athena who uses it as a startling accessory to her aegis. I like to think of this as the third of it's type in this blog, the first being Caravaggio's Medusa and the second Arnold Böcklin's Medusa. To keep up to date with the words and pictures I'm sharing now head on over to my new website, www.sarahfallon.net. I'm talking reading, writing and all kinds of daydreamy things. In addition to the temple incident, which was not her fault (Being raped by Poseidon) . . . 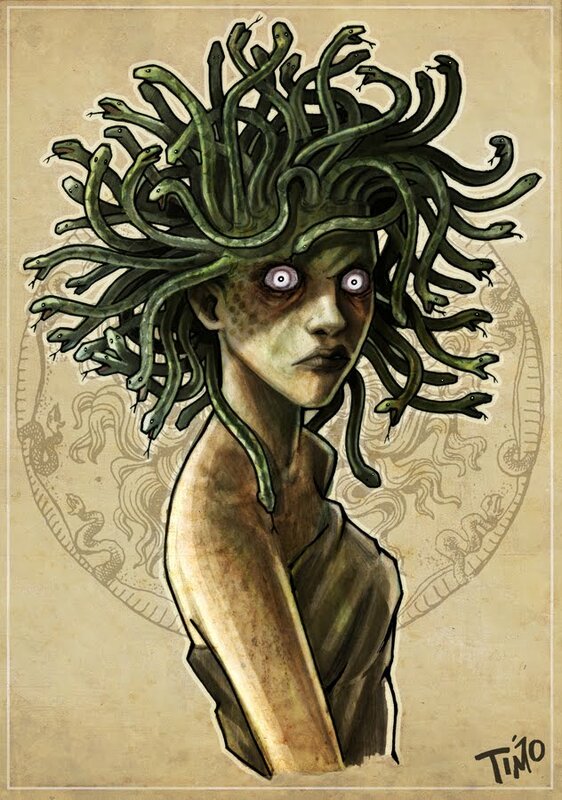 The reason Medusa was turned into such a monster was because she dared to brag that her beauty and her long lovely hair was beyond compare to the goddess Athena. So what else would a spiteful goddess do to a vain mere mortal: Make her ugly, ruin her hairdo, and literally stone any suitor of hers. 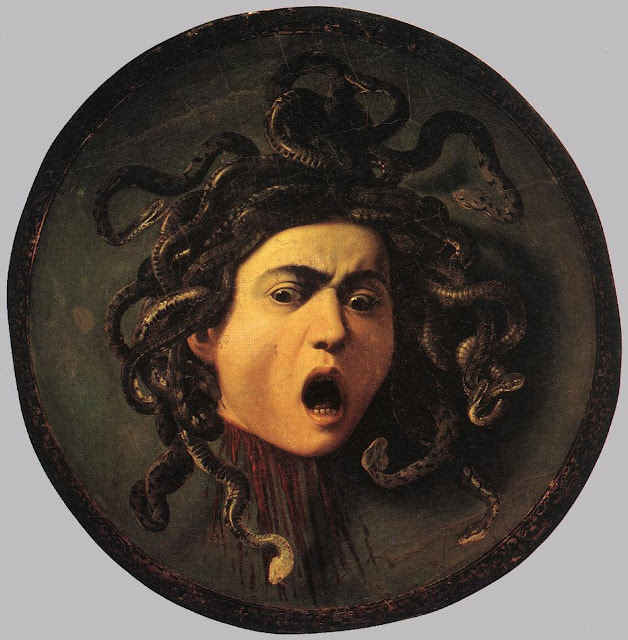 "...tapintja merészen a görcsös, a szörnyű Medúza-valóság kő-iszonyatját ..."
Why would the story of Medusa infuriate you? Yes, what happened to her character was horrible and an expression of extreme misogyny, however it is impossible to know exactly which version of the myth the ancient greeks lived with and in what time. Most importantly, why judge an ancient myth by modern day humanist standards? The ancient Greeks' culture is so rich and influential that it still speaks to us today, and many of what we have comes directly from them, including modern day storytelling, which they basically invented with their incredible mythological stories. To be infuriated by them because of their misogyny is petty and narrow minded, and it greatly hinders the opportunity to appreciate them because of their inherent greatness and richness as well as their insurmountable importance to humanity's cultural legacy. You shouldn't be infuriated by Medusa's fate or anything about their culture. You should strive to understand it and appreciate it, and apply the positive of it to our world today and see the bad and realize how far we've come and just how priceless it as a whole is. Some of us see these characters as friends of ours. Well that is silly. 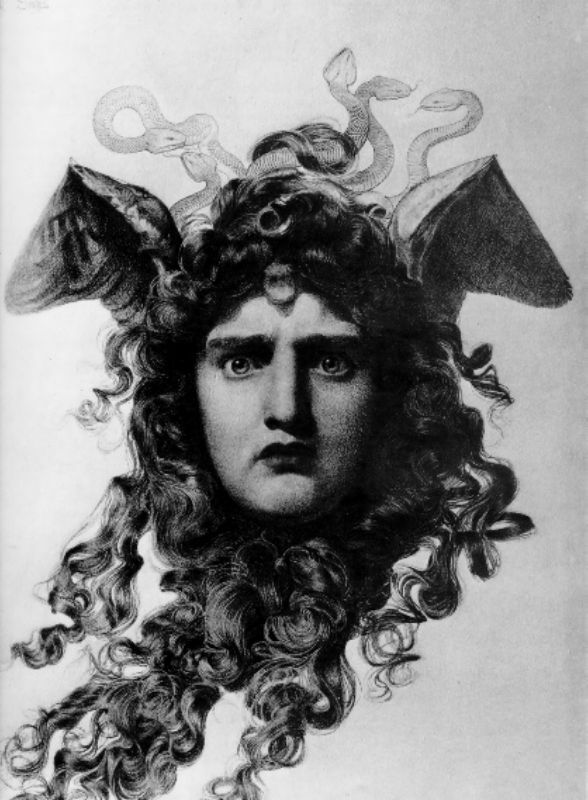 May I also say that the whole Medusa was beautiful and punished by Athena thing is incorrect. Yes it was told by Ovid but it doesn't explain the existence of her sisters, Stheno and Euryale who were monstrous. 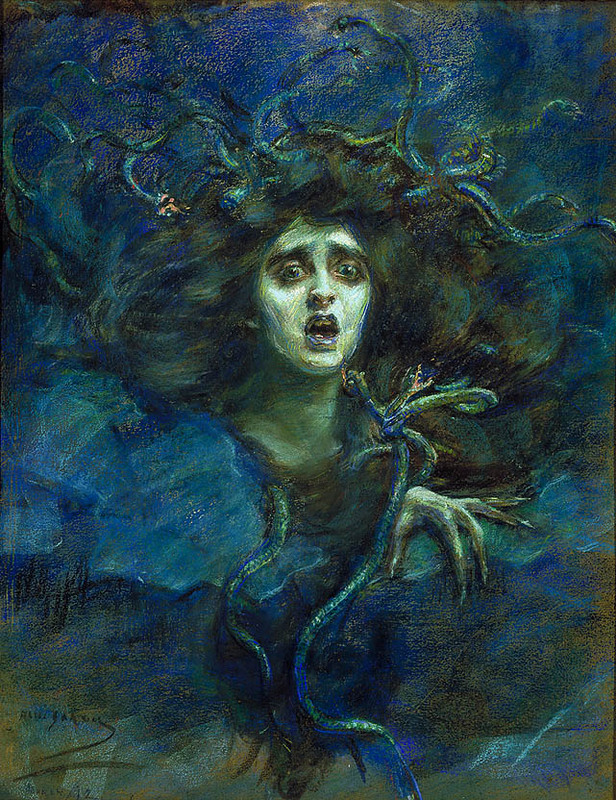 The canon of the story is, Medusa and her sisters were all born monstrous and they were titans, and they were never beautiful.